More unseasonably warm, sunny weather brought an avalanche of blooms last week. The daffodils, forsythia, Indian plum, daphne, rootstock plum, flowering plum, hardy almonds, and flowering quince all began blooming. 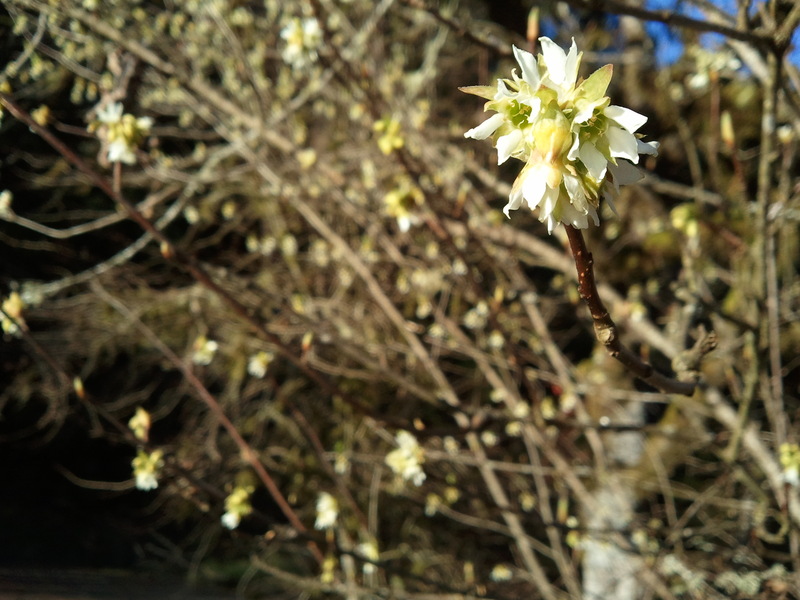 A few willows and the native filberts are also beginning to bloom. My bees have been bringing in the same dusty salmon-pink pollen that mystified me last year. Most of the flowers I’ve observed have yellow pollen. I took look at it under the microscope, but I’ll have to wait until my beginner’s skills improve to identify it decisively. The convoluted hazel nuts are the bees favorites up here in the Mohawk River Valley. This week they should start hitting the flowering plumbs. We had one of our hives collapse while we were gone for 3 weeks. The other 4 hives are doing just fine. I think the one hive starved to death. Good to hear from you, Lon. I’m sorry about your lost hive, and also glad to hear your survivors are in the majority. I think this will be a tricky spring as far as food supplies go. It’s been so warm, the bees must be raising a lot of brood and going through their winter stores quickly. It’s good to keep checking hive weight, for sure.